Think your storefront sign just makes you look good? Think again. According to a global sales research study 76% of customers chose to enter stores based on the sign alone. What should you do about your exterior lighted sign strategy? Let’s find out more. Exterior Lighted Signs grab attention night and day. Looking for great LED exterior lighted signs for the Chicago area? Then contact us or call us at (630) 289-7082. In 2012, FedEx commissioned a survey through Ketchum Global Research and Analytics to find out how much signage makes an impact on sales. In the study, nearly 3/4 of those surveyed recommended a store based on the exterior sign. Another 68% admitted to making purchases after being enticed by the business signage. First impressions make a big difference in any encounter. For the business with a storefront, the signage makes the first impression. Are you serious or playful? What are you all about? Signage alone sends a powerful message to every passerby. They might not stop in at first glance, but each time they see your sign, it reminds them that you’re there. Just like you can make a good impression, poor signage can break deals as well. The FedEx study showed that 68% of potential customers believe that a store’s sign is a strong indicator of the type of product or service the business offers. What makes up a great selling sign? First of all, you want clear lettering, without a lot of clutter. You can see how Bartlett Vision did this with simple white lettering while using the letter “O” to give some added character. 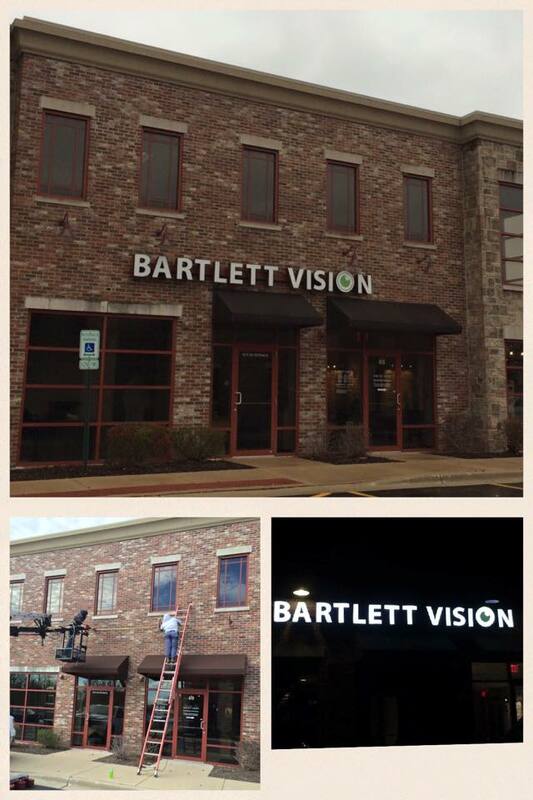 The next time a person needs eye care or glasses, they’re sure to think of Bartlett Vision. LED backlighting makes sure the sign is clearly visible all night long. This strategy converts the outdoor sign into a 24/7 sales machine. LED exterior lighted signs are installed quickly and require low maintenance. LED light bulbs last up to 50 times longer than typical incandescent light bulbs. For 12 hours of light per day, the average LED bulb will last 11 years. Install a great sign and watch your business grow. Contact us or give us a call at (630) 289-7082.